How to be Pink and Conceptual at the Same Time. Sometimes I think that characters exist beyond us; we are merely temporal vehicles or carriers. 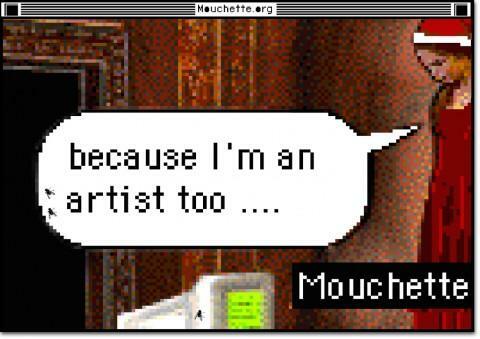 There were often times when I wanted to get rid of Mouchette because all the work was taking over my life; in a way I was her slave. Martine Neddam the artist was taken over by Mouchette the character, which didn’t even belong to me. Mouchette first appeared in 1937 in a book by Georges Bernanos. Later, in 1967, Robert Bresson made a movie calledMouchette, about a French teenager who commits suicide after she is raped, and I loosely based Mouchette.org on these characters. Others have also used Mouchette.org. So it’s come from somewhere and is going somewhere else and I’m the carrier in between.